Furthermore, it’s probably safe to say that you envisage the financial decisions you make throughout your working life will eventually lead you to a point where you have accumulated a sufficient amount of wealth to generate cashflow for you to not only retire, but retire comfortably. With this in mind, in our article, ‘Ageing and health status in retirement: The three chapters’, we discussed the fact that there are different chapters that you will experience as you progress through life, for example, accumulation, transition to retirement (where applicable), and retirement. Importantly, whilst we focused predominantly on retirement in our previous article, in this article, we take a big picture view by looking through the lens of an important financial model. In a nutshell, the financial lifecycle is a model that provides a simplistic framework upon which to better understand the path you travel during your life. Namely, your progression from financial dependence to independence with regards to wealth accumulation and cashflow generation. Before proceeding further, it’s essential first to understand that when it comes to wealth accumulation and cashflow generation, cashflow can come from several different sources (either in combination or isolation from one another). For example, cashflow from employment, self-employment, business interests, and investments. Moving forward, please see below for a helpful diagram. 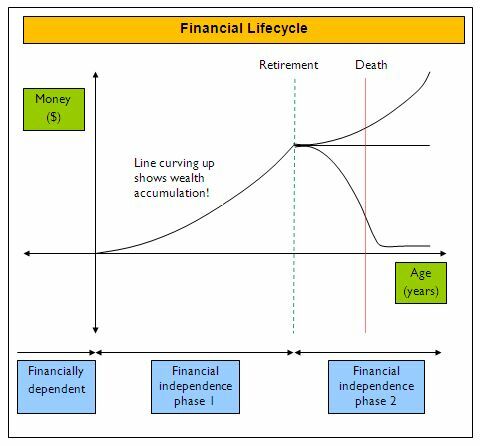 This diagram serves to not only highlight at a glance the main features of the financial lifecycle, but can also be used as a reference guide as you make your way through the remainder of this article (which delves further into the detail). The financial lifecycle has three distinct phases. Please note: The generalisations utilised below are aimed at providing you with a broad understanding of the different phases within the financial lifecycle. As such, it’s important to remember your personal financial situation, goals and objectives may differ from the descriptions provided. Young. In the beginning, you may find that you are living at home and undergoing either secondary or tertiary education. Furthermore, you may have a casual or part-time job; however, it won’t be a high priority for you (e.g. due to above). Given this, you will be predominantly financially dependent upon your parents or guardians as your cashflow from employment won’t be enough to cover your present expenses. As such, your wealth accumulation will be largely non-existent at this point in your life. Young to mid-life. Initially, you may find that you are no longer living at home and have completed your education. Furthermore, you have a full-time job (i.e. employment and/or self-employment), which is a high priority for you (e.g. with regards to building your career). Given this, you move into the first phase of financial independence as your cashflow from employment and/or self-employment now covers your present expenses. As such, wealth accumulation will start to gain traction; however, it will most likely be directed towards areas such as buying your first home, getting married and raising a family, paying off your HECS, further education or professional development, business planning etc. Mid-life to pre-retirement. As time passes, you may find that you are close to paying off (or have paid off) your debts, your financial responsibilities to your children are lessening, and with one eye on retirement planning, you are starting to invest in business interests and/or investments. Notably, your sources of cashflow will begin to undergo a transition, namely, an increased amount will start to come from business interests and/or investments. As such, this is a turning point for wealth accumulation, as it means that you are becoming less reliant on generating cashflow from employment and/or self-employment. Pre-retirement. Continuing from above, you may find that you are in the highest income earning years of your career, your children have flown the coop, and you now have both eyes trained squarely on retirement planning (and a potential business exit strategy with regards to your business interests). 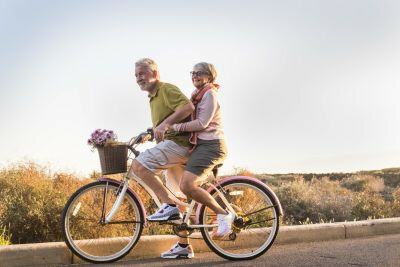 Furthermore, as this stage progresses, you may find that retirement is a genuine possibility as your wealth accumulation is beginning to reach a point where it can generate the cashflow required to cover your present and future expenses. In addition, this may also be where you consider slowing down slightly and making the transition into retirement. The investment of a portion of your wealth into an annuity. The supplementation of your cashflow with part-time or casual work. The decline in your health as you age and the impact this has on your wealth. The strategy employed in retirement, for instance, the three-bucket approach. When viewing the abovementioned diagram, it’s important to remember that we have forgone detail for the bigger picture. For example, due to the perspective used (i.e. incorporating a person’s entire lifespan), a smooth line is shown for wealth accumulation. You fall ill and are unable to work for a period (and, rely on an Income Protection insurance policy). When you are living a day, week or year of your life, it can be easy to get caught up in the emotional ride of the short-term moment without giving much thought towards the medium and long-term. In instances where this is the case, you may find that taking a step back and looking at the bigger picture can be a valuable exercise. Importantly, the financial lifecycle can be helpful in this regard as it provides you with an overview of the path that you will travel during your life, from a financial perspective. What is cashflow and where does it come from?